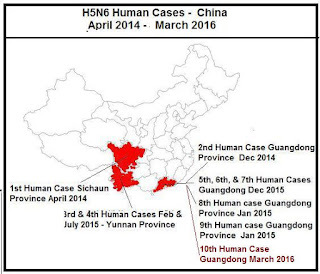 Although there have been only 9 human H5N6 infections previously reported (plus one in the literature) in the two years since if first emerged, half of those appeared between December 20th, 2015 and January 18th of this year and all were from the same Chinese province (see CHP: Guangdong Province - 5th H5N6 Case In Past Month). Since then we've seen reports of H5N6 Positive Chicken Carcasses washing up on Hong Kong's beaches (presumably dumped upstream in Guangdong Province), and scattered outbreaks in Mainland poultry (see CHINA MOA: H5N6 Strikes Rare Bird Farm In Hunan Wuling), but no human cases. This from Hong Kong's Centre For Health Protection. The H5N6 virus is a reassortant of H5N1 and H6N6 that first emerged in the spring of 2014, and since then has generated a good deal of concern as it has been reported in poultry flocks in China, Laos, and Vietnam. It has already turned up in wild and migratory birds in Hong Kong (see Hong Kong: Magpie Robin Tests Positive For HPAI H5) several times. Given the lack of wild bird surveillance and reporting out of Mainland China, we don't really have a good feel for how rapidly the virus might be spreading. While H7N9 and H5N1 have been the most worrisome avian flu viruses to date, H5N6 is showing signs that it is getting its act together, and is definitely a virus to watch.